Hordes of students descended on Charles Darwin University’s Casuarina Campus last week as teaching for semester two got underway. 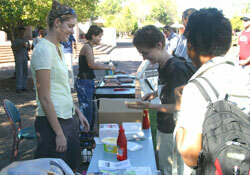 Fresh from the semester break, new and continuing students once again turned the quite campus into a hub of excitement. The week was highlighted by the semester two orientation festivities in which barbeques, live music, seminars, tours and displays were organised for all students. Continuing student in the Bachelor of Business, Robin Basin said he was glad to return to campus to complete his studies and keen to meet up with old friends. For all important dates in relation to the 2006 academic calendar go to http://www.cdu.edu.au/studentnet/calendar.html.